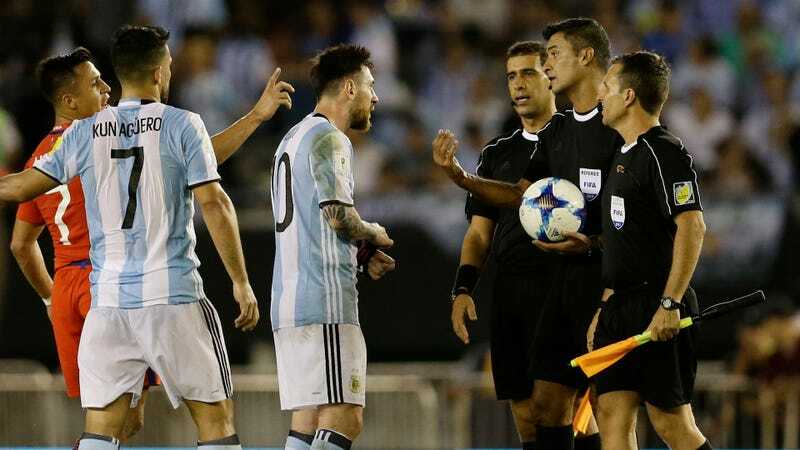 FIFA handed Lionel Messi a four-match suspension from international play today in response to an incident after last week’s Argentina-Chile match when Messi was seen insulting a referee. With only five matches left in a World Cup Qualifying process in which Argentina have struggled, there is a very real possibility that this suspension will result in Messi and his compatriots missing the 2018 World Cup. The referees themselves didn’t mention Messi’s insults in their match report, nor did they recall anything particularly noteworthy when FIFA contacted them once soccer’s governing body opened its investigation. FIFA only got involved in the matter when Chile—who lost on the evening in question and are currently outside the qualification spots in the CONMEBOL World Cup Qualifying table—reported the incident directly to FIFA after seeing video footage of Messi’s insults after the fact. While four matches does sound pretty harsh, it’s mostly in accordance to what we’ve seen before in similar incidents. For instance, Neymar was given a four-match suspension just last summer because of his own postgame antics—though his were more egregious than what Messi did. Still, the repercussions could be huge. Argentina only have five matches left in their qualification cycle, and they will need every point they can get in order to hold on to a World Cup spot in the most competitive region in the world. The top four teams in the CONMEBOL table earn automatic entry to the 2018 World Cup, with the fifth-place team put in a two-leg playoff against a team from the Oceania confederation. It’s going to be a fight to protect their spot. Argentina currently sit in third place in the table, but just two points ahead of sixth-placed Chile. The team has been a disaster for much of their recent qualifiers, and especially so without Messi. In the seven matches Messi missed this cycle due to injuries and his brief international retirement, Argentina have won only one match. A team with Argentina’s embarrassment of attacking riches should be able to squeeze out enough points from a fairly easy schedule even without the best player in the world, but it’s no guarantee they’ll do so based on the evidence we’ve seen so far. This could get ugly. Correction: This post originally said CONMEBOL gets three automatic bids and a fourth playoff spot. It is actually four automatic bids and a fifth playoff spot.